There does seem to be a couple exceptions to this whole custom knife kick I am on. One exception is my EESE’s. For whatever reason, I love these knives. They are simple, tough, and keep an edge like no other production knife I have seen EXCEPT my $15 knife. This old Mora Classic 2 has been used, abuse, sharpened with belts, new edge put on with a belt sander, dropped, kicked, drowned, and it still shaves hair with only a little bit of time on a strop or stone. This thing is amazing. If you look closely, you can see how bent the tang/handle are. It is much harder to see in pictures, but is painfully obvious when using this knife. Long story short is that I have used it so much for fuzz and feather sticks that I bent it a bit. Now many of you have already discovered the sharp steel goodness of the Mora line of knives. This was one of my first and the only one from the “old days” that somehow survived. Some were gifted to friends and family. Many more just ended up lost. I did break one while trying to baton a very hard piece of cedar that was borderline fatwood. Here is the final surviver of all the torture dished out upon the batch of Moras I got years ago. As you can see, this has been slightly modified. I sanded down the bubble of a handle that comes on it for two reasons. One was to mellow out the bubble and the other was to get rid of the red lacquer that covers the birch handle. As noted by several people, this industrial strength coating stinks and is so injected into the wood that there is NO way that it could be anything but harmful to your health. The worst part is that it gets REALLY slick and slimy after living in the PNW’s squishy environment. To help make it less “hazmat on a stick” I sanded the lacquer off and carved in a corkscrew type groove around the entire handle. I found that this made a HUGE difference in making the handle more PNW friendly. I also had to make a modification to the spine of the blade. So that I could use the spine of the blade to strike a firesteel, I squared off the back really well with a file. 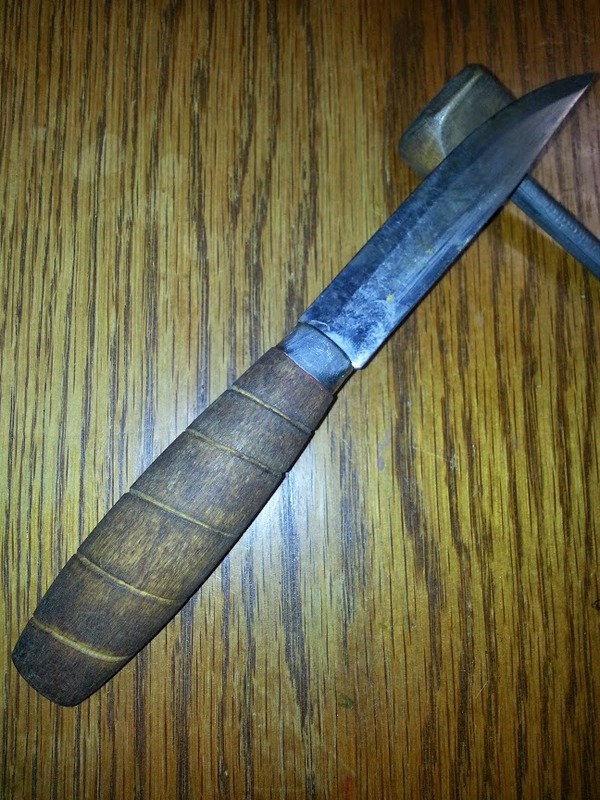 The lightly discolored area between the handle and the “dirt patina” as I call it gets the most use against a firesteel. I have actually used it so much that it is in need of a bit more squaring off and the edges have rounded out a bit. My last modification to this knife was more for me than the knife. I built myself a sheath and made a matching firesteel. When you get your Mora it does come with a plastic sheath. Mine broke in less than 24 hours during its first camping trip. I also lost a couple knives because it fell out of the original sheath. My suggestion is to make something better immediately after getting your knife. 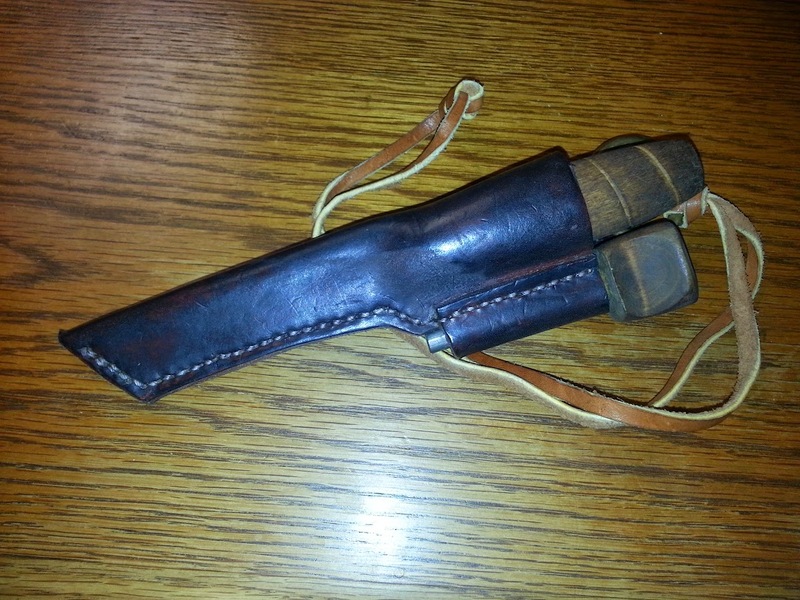 The sheath I made has been waxed and Liquid Wrench is squirted inside the sheath to help keep the blade from rusting. This is very important here in the PNW. It gets so wet over the winter that anything you have used in the field will rust and keep on rusting. 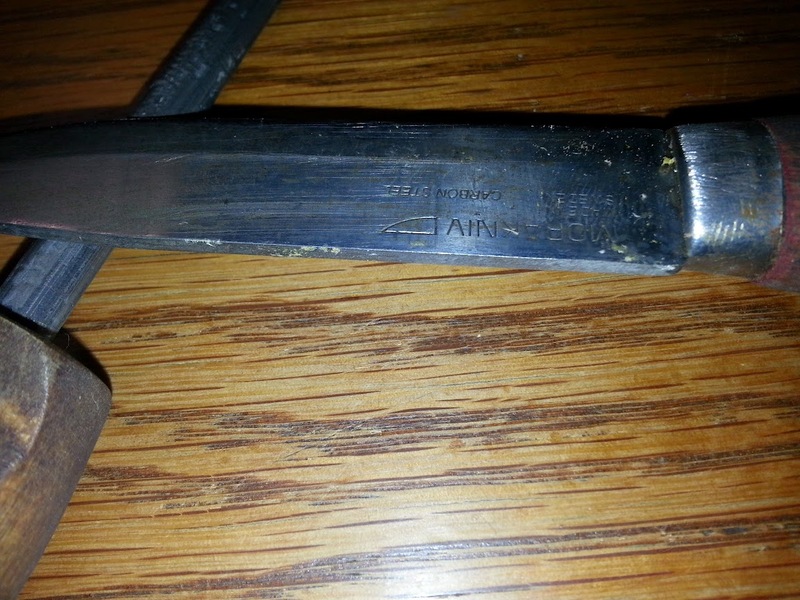 By heavily waxing the sheath and squirting oil into it very once in a while you knife will not be as apt to rust. Handle needs detoxed from the red lacquer. Other than that, this knife is solid and will last you for years. Enjoy!!!! This entry was posted in Edged Tools and tagged knife modifications, Mora, Mora Knife, Mora knives, Morakniv, neck knife on October 9, 2014 by Woodsbum.